“There is a misperception that people come to Santa Clarita to be homeless — and this is part of the resistance to the year round shelter. People think that if you build it they will come. But the reality is that a large percentage of these people were already here.” This is an amazing document prepared by the City of Santa Clarita and Homeless Issues. TRACKING AND REFERRING homeless people throughout the County to other service providers is a task for the fit only. SPIRIT has just been approved to utilize this County system to aid in finding housing our homeless population. It’s not a program for the faint and training is intense, but the services and outcomes are unequalled. With this innovative system, users enhance care coordination and eliminate program and project silos by maintaining a single client record across organizations and seamlessly sharing data in real time. Services recipients must agree to share their information in the system and sign a release. Santa Paula has five of our homeless people placed in permanent supportive housing. That is 7% of our total population. Two have accepted housing in other communities Not all of them want to do that which is another challenge. Safe Sleep in Coming to Santa Paula. We are working with a local property owner, the City and the Police Department to provide a safe place for people to sleep in their cars. We estimate there are 10 people/families who are doing so and we want a safe place, providing security and portable bathroom facilities. We are reviewing the best practices of other cities. We will be working with the School District to determine how many additional families are in cars. Couple living in Steckel Park – baby due in 10 days. Single father of four kids living at Steckel Park. He’s still working but the water pump went out on the car. Cost is $221. URGENT. We are told there are 14 seniors living at the Santa Paulan Senior complex in Santa Paula who have been cited by management for unregistered cars in their designated parking spots. Some of them are not being driven. One reported today if she pays for the tags, she can’t pay for the rent. A project to work on. A Santa Paula woman living in Bakersfield wants to move back home. I had to tell her there is no shelter here and to seek help where she is. Her mother is here but she is a housing voucher recipient and no one can live with her. Thank you to the Lions Club for getting glasses so quickly for one of our men. He’s a different guy today. Note: Thanks to the sweet person that dropped off $20 at the office. It went for the co-pay for Fernando’s medication. You can also do so anonymously by contacting the director. A few bucks here and there. A sign of the times. 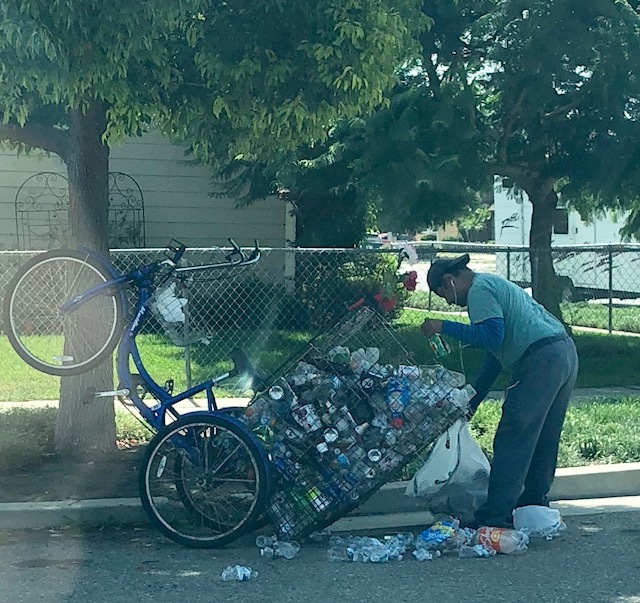 This nice man was working hard to keep the environment clean and found himself with more than the law of physics will allow. For many this daily task provides much needed cash for the basics in life. This is a tell-tale sign of a homeless person nearby. This is also how they lose all their stuff. MANY MEALS MENU: Chicken Puff Pasta with Cheese and Breadcrumb Topping, cooked carrots from Garman’s Pub, orange slices, cole slaw with pineapple, rolls and butter. Dessert is donuts from Angel’s Donuts, pastries and cookies of epic portions. Thank You Food Share! DRIVERS FOUND. THANK YOU to Tom Wilson, John Lopez, Bob Carson, Erendira McCormick, Hank Wychoff, Luis Cantero and Bessie Crowell. PS – We will have a refrigerated truck soon for additional food rescue operations. Wednesday from 5 to 6 pm at 121 Davis Street and Take-Out Dinner too! Editor’s Note: This weekly communication is intended to inform, encourage and educate friends and neighbors on the issues of homelessness, what is being done, what can be done and what remains to be done. Branch Manager, Don Tello. Special thanks to Bank of the Sierra for their generous donation to the weekly Many Meals program at the First Presbyterian Church. Each week, homeless and hungry families receive a generous and nutritious meal along with fresh food from our well-stocked pantry. Mental Illness and Homelessness. Not Every Homeless Person Is Mentally Ill. However, many of them are. One particular man in Santa Paula has been arrested again for assault with a deadly weapon and trespassing. He is waiting release. A plea has been made to the Behavioral Health Department on behalf of Chief McLean who fears the worst will happen one day for either an innocent bystander or for the homeless man. This man spent 30 days in January in a facility and voluntarily stayed even though he missed his mother’s funeral. Because he went back to the streets due to lack of shelter, he found his old ways. There has to be a better way. Photo is from Google Images. Shower Program Update – One Stop Santa Paula. It’s all amazing and it is so appreciated by those who attend. It’s making a difference and it’s bringing all those who participate into the circle of care needed to get them off the streets. The fear is that the longer they are “out there”, the harder it is to get them “in here” because that life becomes normal. Every Friday 9 am to noon, El Buen Pastor United Methodist Church, 1029 E. Santa Paula Street, Santa Paula. Visitors welcome. Thank you to the Whole Person Care Team of the Ventura County Health Care Agency. A TYPICAL PLEA FROM THE STREET: Families Are So Fragile. 1. Funds to complete the cremation and burial of Daniel Price. 2. Mother of six needs $75 to get birth certificates for three to keep them in daycare. 3. Mother of three needs $200 for school clothes and shoes. 4. Mother of six needs money for gas to get to her school and money for kids school clothes. 5. Woman from Santa Paula needs $75 to get her car out of impound in Mexico ($5 per day) so she can drive to work in Chula Vista. Cost $11 to send her $75. 6. Single mother of four living in a motel can cook outside with charcoal needs food. 8. Family needs help with funeral expenses for adult son who just died. $1900 raised in five days; $500 from a car wash.
9. Single mom needs $300 to give to her landlord so she can move in early. Verified. 10. Single female living in a camper needs a battery and gasoline…and registration tags so she doesn’t go homeless. 11. Homeless woman asked for $10 so she can have a meal at Denny’s. 12. Homeless man is living in a shed and taking care of the owner’s dog. He lost the dog today, a young German Shepherd. He wants $250 so he can buy the owner another dog. 13. Not today, I said. This documentary filmed by Green Island Films, is a journey through the worst homeless crisis in America. Filmed in Honolulu, the film gives an up-close look at homeless people. It features two families as they move from sidewalk tents to subsidized housing. You will see and hear the personal stories of substance abusers, the physically ill, the mentally ill, the aged, veterans, teenagers, the working poor, ex-convicts, immigrants and indigenous people. Political leaders, medical and social workers give their input. Open discussion follows. Tuesday, August 28 at 6:30 PM and it is a free event; donations welcome. THIS WEEK’S MENU: Spaghetti Casserole with chicken, green peppers, onions and celery, cheese and salsa dressing, cooked carrots from Garman’s Pub, cole slaw with pineapple, rolls and butter. Dessert is donuts from Angel’s Donuts, pastries and cookies of epic portions. Thank you Food Share of Ventura County. If anyone has an interest in driving our truck to and from various food locations, please let me know. 805.340.5025. If you are able to lift and load, that’s great but not necessary. Times needed: Friday and Saturday mornings, Friday from 10:30 to Noon for Food Share Shopping. Helpers go with you. ‘IF YOU STOP FEEDING THEM, THEY WILL GO AWAY.” The Street Beat in Santa Paula. Week No. 491 on June 27, 2018. STATS JUST THIS PAST WEEK: Thanks to our volunteers and our supporters, 500 meals were prepared for our guests at Many Meals; 192 families took advantage of our food pantry and USDA food distribution with fresh strawberries, peanut butter, rice, beans, bread, yogurt, orange juice, crackers and green vegetables. This is the hub of weekly connections for own community to receive support in small but meaningful ways. If I had a nickel every time I head that statement, I could pay the water bill for 100 families. There are many good reasons why we are so keen on serving so much food. This friend lives on streets in Santa Paula. He is from a family of nine and has a brother also on the streets. He shies away from groups and rarely comes to the Drop In Center. As a result, he earns his money by dumpster diving–a dangerous and nasty sport. His elbow was invaded by a shard of some kind and became infected in hours. After a trip to the ER, we had to come back in the morning for another examination when the doctor said he needed surgery. He was transported to Ventura County Medical Center and after surgery, was discharged two days later to the street. Within a day, his bandages were dirty. For those who see us daily, here is why food is basic. When they feel better, they have more energy. When they have been fed, they are often more cooperative to get things done. Like us, they will be healthier when they die. Today we had a visit from one of our shelter-fragile guests. She was crying. Apparently her living situation is deteriorating. Someone in the house tried to take her wheelchair away and she was frightened. She was so upset she couldn’t talk. She came to the Drop In Center after hours for some comfort and said to Maria, “Just walk with me.” They did. We’ll see what to do for her. Sometimes that’s all they need and we know how to do that. The dialogue about “what we wish for” is passe and has no place in the war against poverty and homelessness. As a professional property manager, I see a new class of homeless as a result of rising rents. A four bedroom home on No. 13th Street in Santa Paula just rented for $2,300. Already, the tenant can’t make the second month’s installment due to an illness in the family. The solutions are: shelter, health care, basic necessities, child care, wider use of existing Section 8 vouchers, education, access to mental health services, stable incomes… to mention just a few. And, we need equity in the application and availability of services. Great steps are being taken in a variety of areas. SPIRIT of Santa Paula has been approved to participate in the Ventura County HMIS (Homeless Management Information System which creates multiple opportunities to serve our vulnerable populations. Local groups are working towards improving access to services by establishing an “Under One Roof” facility. SPIRIT received a grant from the County’s CDBG funding cycle to do more with our homeless and family support shelters. Dialogue is underway with the City of Santa Paula’s top leadership and the County of Ventura for housing options and programs. Wednesday is Many Meals — for Anyone. As always, we anticipate new people with new needs at Many Meals, every Wednesday from 5 to 6 pm. We have seating in the dining room, family style, and take-out for the evening meal and likely the next day. It worries me when I see a homeless person take three meals. I always pray it is for someone else and not to be saved til the next day. Grandmothers and grandkids eat together, spouses come to have a night out with friendly hosts. The address is 121 Davis Street, Santa Paula, hosted by the First Presbyterian Church who also sponsor church at the park on Sundays at 11. This week’s menu is: Chicken and angel hair pasta casserole with sesame dressing, fresh tomatoes, olives, celery, onions; fresh strawberries, orange wedges, cooked carrots from Garman’s Pub, rolls and butter. Some of our best helpers are high school students who show up to help and have fun at the same time. THE GOAL IS TO END HOMELESSNESS IN SANTA PAULA. This is how they do it. Natalie is sleeping in the park and this is how I found early this past week. She came into the Drop In Center, famished and weary. It has to be a long day for her and sleeping in such an exposed manner is fitful, making for the beginnings of a hard day, every day. case, she needs a variety of help and care. Most of all, she needs gentle words. She takes everything to heart and doesn’t want to bother anyone. Gabriel is sleeping behind one of our churches on a Saturday afternoon. He was rousted by an officer due to a “No Trespass” sign just above his head. Jeremias was at the park on Saturday and extremely intoxicated. He thought about going to the Rescue Mission but after a snooze on my office floor, thought better of it. Thanks to the regular visits of our mental health and Whole Person Care professionals who visit our streets and follow up at the Drop In Center, many of our homeless people are coming closer to the source of help. It’s an old adage, but they truly don’t care to help themselves until they feel they are worth it. We believe all things are possible. Are these things easy? No…. sobriety is very hard work. We wish to the thank the committee known as Project Hope, chaired by local resident, Pam Marshall and initiated by Council member Martin Hernandez three years ago. The goal was to bring light to the subject of homelessness in Santa Paula. There were 29 committee members and partners who met regularly to learn, express concerns and share ideas about how to end homelessness. Thank you for the hard work and genuine enthusiasm. Heaven promises many joys and benefits. One of them is that we will never lose anything for which we have no need–phone chargers, cars, keys, socks, pills or purses. I learned again today why the problems of homelessness cannot be solved in multiples. It is common for people to lose the things they need to solve their housing crisis. Most of us have our ID handy, can find our social security card and at least know how to get a copy of our birth certificate in short time if needed. This is just not so with people who don’t carry a purse, have a file cabinet or a file folder. Today was such a day. We are preparing one of our homeless people for subsidized senior housing. It has taken us three weeks to get a birth certificate, the doctor’s certification, her homeless history verified, her ID card and a phone that works more than two days. Today was the day for the visit to Social Security. I dropped her off at 8:30 with money for bus fare back home and new charger for her phone. She saw the line and thought not to stay but I told her she had to. She was back at the office by 10:45. I asked her if she was successful and she admitted she was not because she had forgotten to take a copy of her birth certificate, even though the folder was in her hand and she couldn’t remember what name she had on her last card. She also needed her pain medication which she did not have with her. We will try again, although not tomorrow. I would like to find someone who take her and stay with her as she works through the steps at the social security office. Their problems can only be solved one person at a time. That is why the work is so hard and it takes so long. People who have lost their shelter lose their orientation to routine. Few of them know for sure what day it is and time has little meaning. They miss doctor’s appointments, deadlines and court appearances. When life gets this complicated, I can understand why some self-medicate. Then, they don’t care and it’s just easier to get through today. An interviewer asked me today what percentage of homeless people don’t want to be housed. My guess is 50%. Those who don’t are what I have described above. Rules worry them because it translates to giving up drugs and alcohol. The other 50% will do the work to get their housing. The work cannot be done in tandem. It’s one event at a time with focused energy on one person at a time. You have to stay with it and cheer the success, however small. Back to losing things. One of my favorite people has decided that a sober life is too hard. He has been in detox twice in the last twelve months and came back two weeks ago. He found his friends and started with a few beers. He left his back pack with me when he left and completely forgot about it when he came home. He started gathering his things all over again. They all do. They need new blankets every few days because they are stolen. They need sweaters and jackets because they lay them down somewhere when it’s warm. They lose their ID, their phones get stolen and they all want money for bus fare to go somewhere. Sadly, critics of homeless people in general tend to generalize that homeless people “like it that way.” They forget to focus on the 50% that long for housing. Now that law enforcement has cleared the river and the tracks, more of them are in and around town. There is no bus to take them somewhere else and they wouldn’t get on it anyway. Every community has their own homeless population. They don’t want ours and we don’t want theirs. Ideas are being parlayed about homeless shelters. Funding is one problem but the greater one is location. Savings to taxpayers just from redirecting people from emergency care to primary health care would pay for the building, but there is no will to build one. No one wants it near them, but they are near all of us now. We helped a woman today pay $400 for her room. We heard her story, the details of which I can hardly remember about her losing her green card and then her ID card and her monthly check was diverted somewhere else because she moved twice in a short time. And, she was about to be homeless. We talked to the landlord and she was actually two months behind but he promised to work with her. We usually never help someone who is that far behind and has no way to pay for the next month’s rent. However, when she is standing in front of you with no hope, there is only one thing to do. She is also a good helper at Many Meals. In case you are one who thinks the solutions are quick and easy, I urge you to either be patient with those working on the problem or provide the help needed to move it along. I am surprised how many people know someone who is or has been homeless. Those who are homeless from an economic crisis can be helped much faster. Substance abuse creates a barrier to a quick solution. Without our partners at Behavioral Health and the Healthcare Agency, we could not look at any success. They are all amazing. We are missing our clinician, Ted Perez. A serious infection put him in the hospital. We need you, Ted. Lots of food today from our favorite food bank, Food Share and we will be preparing a nice meal as always, thanks to thoughtful and creative. Tomorrow’s menu is ham casserole with olives, tomatoes, onions, celery and dried blueberries with an artichoke sauce; hot buttered carrots thanks to Garman’s Pub, orange slices, green salad with tomatoes and Cesar dressing, rolls and butter. We put about 30,000 pounds of food back into the community last month, thanks to our School District. We rescued so much food. We will miss them for the summer months. Thanks to all for the encouraging notes and your willingness to listen to the other side of the story — the human side. Kay Wilson-Bolton is the volunteer director of SPIRIT of Santa Paula. She can be reached at 805.340.5025. Address is 113 North Mill Street, Santa Paula CA 93060. Each week I have experiences revealing again that homelessness is not just about vagrants or transients, the new names that further categorize and stigmatize people who are homeless. She is 74 years old, has an elegant name and dresses like a model. She rents a room with no kitchen privileges so the Drop In Center and Many Meals is a life-line for her during the week. She has lost her upper teeth and is very conscious of her appearance. She came to see me today in tears and told me the person who rents her the room has been mean to her and borderline abusive. She is afraid of him and he is threatening to kick her out. She is fearful and confided in me that this circumstance makes her want to go back to drinking. I think most of us have a trigger of some kind that pushes us to shop, or to that chocolate donut, latte or frozen yogurt when we need something to comfort our wounded spirit or calm a fear. In her case, it’s the bottle and she knows it. She can sense she is moving closer to homelessness and drinking alleviates the fear for a while. I assured her I would be there to help her. She has a permanent disability and just finished a bout with cancer. We started her application for senior housing and will get into the Pathways to Home Program with the County of Ventura. Jennifer Harkey and Jackie Villanueva are case workers and saints in my world. Jose agreed to go into detox last week. He was there for seven days and looked so good when he came home. But, because he is homeless, he went back to the streets where he quickly found his buddies. He figured he could have a couple of beers, but it turned into two six packs and it’s all undone. He had a very responsible job but too much time on his hands, His mother cries and so does he. He is very ashamed of his habit and his weakness. He was offered a bed at Kephera House, arranged by Tom from the Whole Person Care Program, but decided he was “good” and passed on it. I’m told your body can reach a point where you can die from one more drink. The wonderful Shelby Hardy is a caseworker with Whole Person Care. She was successful in helping one of the better known men, who is in clear view of our community every day, enter a rehab program last week. She transported him on a Friday. The program is about 30 days. On Monday, he was back in town because he didn’t like being with drug addicts and being confined. There you have it. What to do? I’ve mentioned a woman who lives in a commercial building in town. She’s doing what she needs to do to gather her paperwork for the County’s housing program for disabled seniors who are homeless. Her birth certificate arrived today and we are just waiting for her divorce papers and social security card. She learned today that it was election day and she cried because she didn’t get to vote. Clearly being homeless doesn’t mean you stop living. It just means you have to find a way to get through the days, find food and a safe place to sleep. Her government phone finally died so SPIRIT got her a new one. She needs to stay in touch with all the agencies connected to her search for housing and medical care. The One Stop in Santa Paula has made the difference in her quality of life. While not in the best place, she is not on the street with her little dog. One reason people who are homeless languish in that state is because they change their phone number so often. They lose their phone, it gets stolen, it’s a cheap one and it crashes, or they use up their minutes and have to start over when they have money for more. It was graduation at one of our elementary schools today, and the son of a woman in our circle received top honors winning a trip tomorrow to a famous place with one other student. This family is homeless but safe in a very marginal living environment. Clearly he does his homework and gets the encouragement and support he needs to make his way. A counselor in the Fillmore School District called today asking for help for a family with three children. They had to leave their apartment due to flooding while they were at work. They have no family here and no resources of their own. They slept in their car last night and we were asked if we would put them in a hotel for tonight. I learned who the landlord is and called him to suggest he needs to offer them lodging or at least vacate the rent for the days they are out. He was slow to agree to the latter, but he did. He shared the name of the property manager so we will follow up with him to be sure credit is given. If their home can’t be repaired, we will have a serious problem. So you see, homelessness is not restricted to vagrants and transients. We know that category is the group that makes the mess, creates problems, causes trouble and irritates a community. Many of them want “out” of those circumstances but feel trapped or are enslaved to drugs and alcohol. They aren’t ready to do the hard work and there is no place for them to go. SPIRIT is reaching out to partners in the housing industry and in the business of social services to act diligently in creating housing opportunities. We will be relentless until it happens. Meanwhile, we continue to rescue unserved food from the Santa Paula Unified School District providing wonderful quantities of meat, milk, sandwiches, hamburgers, burritos, fruit, etc for use at the Drop In Center. Nothing goes to waste. We closed the Drop In Center last Friday and served breakfast at the One Stop instead. We had our best day I’m told, about 25 people checked in for medical services and showers. James Boyd is the master of ceremonies there and has the same heart for this work as we do. He agrees that “one at a time” is worth it all. So, in preparation for the weekly lifeline at Many Meals, we are serving Turkey Pot Pie with vegetables and gravy, mashed potatoes, cooked carrots with orange glaze, orange slices, rolls and butter. Our cooks are the best and prepare these meals as though for their own families. I can’t thank them enough, or the members of the Presbyterian Church who allow us to use their wonderful commercial kitchen and facilities. BTW, once in a while, a reader chides me for grammatical errors. I write this late on Tuesdays and often while a little bleary. I will take a little grace on that if you will. It happened again this weekend. He was belligerent, half-dressed and wandering the streets talking to himself. He was arrested a week ago. That makes 15 times since 2015 and many of these were in the last few months. What to do? The Police can do nothing more until this person is declared “gravely disabled.” It won’t be soon. He is very resourceful, having lived on the streets for several years. His brother is also on the streets, as was a brother before him who died while incarcerated in the Todd Road jail. What is the common thread? One homeless man in another part of the County visited the ER 152 times last year. One of ours who died in January, was at the Santa Paula hospital ER no less than an estimated 30 times. I took her numerous times and she was transported by medical professionals many more. A woman in town was arrested today for throwing a rock through a car window. She’ll be out soon and the cycle begins again. She is homeless half time, coach surfing here and there. The One Stop is making such inroads into helping our people who are homeless find their way. The shower is everything to them. Some are lazy however, and come by the Drop In Center for a breakfast snack and then decide to forego the shower because they don’t like to wait in line. Starting this week, James Boyd from the Whole Person Care program agreed we will close the Drop In Center on Friday mornings and serve a light breakfast at the Church so there is no excuse for missing this important engagement. They can see a doctor, a nurse, get assistance with their MediCal and other benefits including Pathways to Home. Through that program, four of our people have found rentals; one in Camarillo, one in Ventura and two seniors right here in town. While they prefer to stay in Santa Paula, it’s likely a good idea they relocate so they can make new friends and find new opportunities. I learned again this weekend what causes homelessness beside alcohol and drug abuse. A woman with three children had her water turned off because her family stopped making the monthly payments. There is a back story to that, but while the property was posted with a disconnect notice, the water remained on. She thought the bill had been paid. She came in last Friday with a water bill of over $1,000. Someone called CPS and reported her for living in a home with children with no water, making the dwelling uninhabitable. Thanks to Father Charles at Our Lady of Guadalupe Church, we raised the money to get the water back on. Another single mother with six children, attending school to become an x-ray technician, couldn’t start her car on Friday. We had it tuned up as someone suggested. $184. No luck. We put in a new starter. $139. No luck. Last night we put in a new battery and still no luck. $179. Someone suggested a new ignition which apparently leads to other things and we realized the 1999 car isn’t worth fixing. Her children attend school in another city for several reasons and she has to transport them on her way to school/work. Another woman working closely with the County to get housing discovered yesterday that her “free government phone” died. There go her contacts and her appointments. She has no way of communicating with the outside world that can rescue her. So we got her a new phone. The absence of money is one thing; the absence of resources to solve problems is another. Many Meals continues to be the link to fragile people. A woman came in last week who was so anxious to be around people she almost fainted. Fortunately, Ted Perez from Behavioral Health stopped by after work and recognized what was going on. He reached out to her and was able to make an appointment for this week and they connected again today. She came to our food pantry on Saturday and she called today to see if anyone was able to give her $20 so she could pay someone to bring her into town to get food. The Bible talks a lot about money and how wonderful it is to give it. It is the love of money that traps us, but I have noticed that many are trapped because of it’s absence and scarcity. One seemingly small event can turn a family upside down and jeopardize their ability to pay rent, leading to eventual homelessness. We can’t buy batteries for every car or pay everyone’s water bills. It seems we are presented with one or two at a time we can help and with some of the angels who hang out with us, we make a difference. Susan Kulwiec, Jill Wallerstedt and I are regularly writing grants to find funds we can use to help stabilize our families and be the safety net they need to get through a day. I just pray their kids grow up to be successful and able to support their parents in later years as a “thank you” for the hard work done in these. Our work is more than just with those finding shelter in the streets. It extends to the least powerful and most vulnerable in our community. I am pleased to report the City Council approved forming an Ad Hoc Committee to study and work on the issues of homelessness. They members are Jenny Crosswhite and John Procter, two fresh faces looking at the problems and opportunities and willing to engage the locals on what is being done and must be done. There is another side to this work that can hurt. Last week, one of the men who lives on the streets as a result of alcohol addiction, has been asking for another phone. He is one who misses appointments, won’t attend the One Stop, consistently asks for bus fare so he can visit people in Ventura and is taking his medication with alcohol. He makes promises he doesn’t keep and sleeps at a local church. He called from the Job and Career Center and challenged me about when I was going to get him his phone. I told him I wanted him to use some of his monthly check to get one. He flared back that “my talk was cheap” and he had no use for me. I told him “thank you” and hung up. I’ve been thinking about that but know he’ll be calling soon when he needs something. This is the test. Will I be there or not? As we wait the 5 pm hour on Wednesday to serve our nutritious meal, I can’t wait to see who comes to find us. Our meal tomorrow is beef enchilada casserole with rice from El Pescador, cooked carrots from Garman’s Pub, cole slaw with raisins, croissants and orange slices. Many of our student volunteers have promised to come during the summer. They are the best help. After you read through tonight’s report on our work, please take a minute to visit our new website: www.spiritofsantapaula.org. Thanks to Council member Jenny Crosswhite and her husband, Daniel Sandoval, for the sparkling new look. They are in the business of computer graphics and web design. This scene plays out regularly at Many Meals at the Drop-In Center when parents call me to ask if we have seen their adult children this week. I received two such pleas today, one in the form of a text message: (not the daughter’s real name). Shannon has children who live with the father’s parents. She hasn’t seen them in many months even though they are in Santa Paula. Thanks to our partners in the Whole Person Care and the entire Ventura County Healthcare and Behavioral Health agencies, we have learned the ropes for resources available to people with mental health challenges caused either by disorders or prolonged substance abuse. A friend brought me a great article today on a judge in Los Angeles who has established a jogging/running program for homeless people who want to get healthy. Wonderful program but it is a down-the-road result of gathering people who want to change their lives. Until they are ready, there is no motivation to walk to get help, let alone run. There are so many success stories. I know there are not enough to make the community understand what a slow process. What I hear from people is, “Get them out of here.” The question is, “Where?” Every city has enough of their own and they don’t want ours. This may sound like the sharing of confidential information, but Paul is my client too and we work as a team to reach him and serve him. There is a stronghold of people who live in the River because they want to be away from town to do their thing. They stick together and protect each other. That group has no affinity with the group that lives at the tracks. It’s a challenge to break into these strongholds. We have to drawn them in to us. SPIRIT of Santa Paula was funded today to install trash bins near both places. One person at each spot will be paid to fill the bins each week in an effort to clear the trash and debris. Porta-potties can be stationed nearby if there is no objection from neighbors. There will come a day when their condition will be so bad they will reach for help. We and our partners will be there. The mental health issue has to be addressed with some of them. One woman in particular is living behind a building on Main Street. I was able to get her to One Stop last Friday for a shower and registration into the Homeless Management Information System. She was back in her spot, now very nasty from using it and her small mattress as a bathroom, talking about her 38 mothers and fathers who are in heaven but some of them are still looking for her. She can be arrested on a 5150 hold if she is a danger to herself or to others. If not, without new legislation to hold someone up to a month, the courts will be required to let her go. She cannot be held against her will. It’s a terrible dilemma. The horns of that dilemma are the limitations on the police, the unfair impact on the shopkeeper and the rights of an individual to be homeless. SPIRIT board hopes to initiate a public forum in each of our supervisorial districts to let the public know what is being done, what can be done, and what opportunities exists for resolution of the homeless issue. The County’s CEO staff is considering options for such presentations. I would like you to meet long-time founding board member, W. John Kulwiec. The early conversations about SPIRIT and a role for our good intentions began in his home back in the year 2000. John serves as Treasurer and provides very experienced leadership in the non-profit arena. He has served many years on the Boys and Girls Club board and has been active in many local organizations, including service on the Santa Paula Planning Commission. He is the founder of Kulwiec Group Architects and is married to Susan Kulwiec, Interior Designer. Susan is serving the SPIRIT board as Director of Development. John has a long career in architectural practices and is formerly a licensed contractor. He served in the US Air Force Civil Engineering Department and he is an expert witness in forensic architecture. John has a Bachelor of Architecture from Illinois Institute of Technology in Chicago with a major in Architecture and a minor in City Planning. 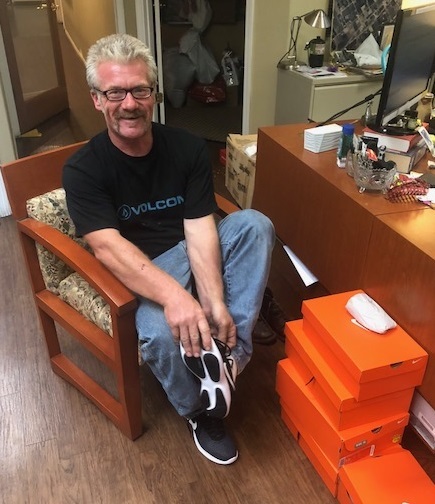 He is a longtime resident of Santa Paula and been a champion of many local causes including the effort to end homelessness here. Thanks again to Food Share, we have lots of fresh vegetables for tomorrow’s pantry. Our menu is Turkey Pot Pie with mashed potatoes, fresh cooked carrots, cole slaw, grapes, butter and rolls and orange slices. Next week’s profile is on our board President, David Bavero. “Every city in Ventura County is suffering from the tragedy and loss of Mr. Mele at the Aloha Steakhouse. The sad reality is what happened there can happen anywhere. It is a matter of time until the same circumstances exist for another unstable, emotional individual to go on the attack. There are near-misses every day. I know. Every City has homeless people. They are either to the climate and the comfort or they are homeless in their city of origin or where their kinfolk live… children, parents, and siblings. To think I could round them up and get them on a bus to go to another community is inconceivable. It’s difficult to get the to the winter shelter at night in Ventura or Oxnard because they want to “come home” during the day. Police officers cannot be everywhere all the time. Service providers can’t provide everything people who are homeless need, especially those with the challenges of substance abuse, depression, anxiety and mental illness. The majority of the calls to the Santa Paula Police Department are for issues dealing with people who are homeless. Most are for things they do that irritate people, not necessarily for violating any laws. It’s a complicated problem and it’s getting worse. Good people in various places are doing some things. No one can do everything and collaboration is essential. Serving food reduces panhandling and stealing. It also keeps them healthier while on the streets. Providing temporary shelters keeps them from peeing and pooping on the streets at night, but they are on the streets during the day without adequate facilities. Providing counseling helps but they have to make it to appointments and in larger communities transportation can be a barrier. Individuals who are homeless create as many challenges as the population of homeless people as a whole. The way they live and where they live is damaging to the environment. The amount of trash they create makes a mess. We are working on providing trash bins and porta-potties in various locations to minimize the impact of their homelessness on our community. Reality is that not every person who is homeless wants to live in a structured environment. They love the alcohol and drugs too much. Many of our people have said “enough”. When the last one standing is ready to say that, we will be there to take the next steps with them. Joining us will be our partners at Whole Person Care, the entire Ventura County Healthcare Agency, Behavioral Health, first responders, nurses, physicians, clinicians, counselors and many more in the network of service providers. 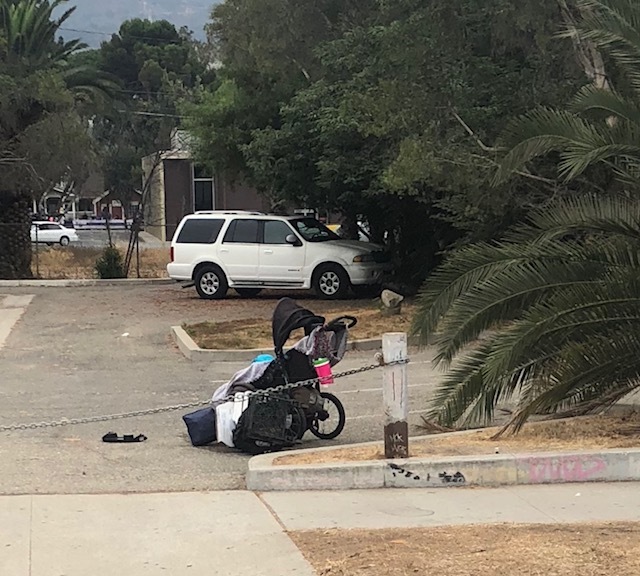 As an advocate for my Santa Paula homeless population, we do what we can every day to minimize the impact and the risks of living among people who are homeless. Some of my people can be aggressive when agitated. We are trained in de-escalating but we aren’t with them 24 hours a day. There is only one real answer and that is managed care in transitional and/or permanent housing. The real barrier is no one wants this in their back yard, their neighborhoods, near schools or work centers. If you build housing away from all these services, that makes for different challenges. The savings to taxpayers in reducing or eliminating the emergency room as their primary care provider would easily cover the cost of building or acquiring housing. One known high-utilizer of the ER had 152 visits in 2017. Imagine the cost of that along with the cost of all first responses and treatment. The Board of Supervisors is calling for all cities to work towards providing shelters. All experts on this topic agree that housing is the missing link and the necessary component to treatment and wellness. Many groups are working on bits and pieces in the Continuum of Care within the County’s system. The missing link has been identified and, like the missing gene, it has to be cultivated or there is no cure in our lifetime.” That’s a wrap. The annual meeting of SPIRIT is coming up and taking a big part in that meeting will be board member and advisor Dr. Bill Simmons. We call him our Futurist. He helps us look at the future differently, more boldly, more wisely and more creatively. Bill is the founder of I-PRISE Communications, a strategic planning and technology innovation consulting firm. He also serves as a senior advisor for Global Trade and Technology, a national 501C3 non-profit chartered to aid and assist in educating and training America’s current and future workers to increase the global competitiveness for 21st century STEM jobs and careers. He currently assists the Center for Threat Management and the Port of Hueneme in areas of technology innovation and the conduct of the Coastal Trident Exercise and Maritime Advanced System & Technology. In 1995, he led the successful effort to defend Point Mugu from closure by the Federal Base Realignment and Closure. He served as the interim President and change agent for the Ventura County Economic Development Association (VCEDA) and he established regional task forces for the Housing Opportunities Made Easier (HOME) and Preserving our Widely Use Energy Resources (POWER). Following the Northridge earthquake, he was a partner in the Fillmore &Western Railway Business Development Group creating “Fillmore Now” and was the economic jump-start in forming the Heritage Valley Tourism Bureau. He is the founding chair for the Fellowship of Christian Athletes (FCA) in Ventura County. He studied aeronautical engineering and went on to earn his Masters and PhD degrees. You can see the dimension of education, experience and leadership Bill brings to our board. Some updates: Noe completed his week of detox. He is on the streets tonight waiting for a bed in rehab. The streets are not a good place for anyone who is trying to stay sober. Pray for him. One of our women who lives in a tent in an unsafe place was put on a 51/50 hold last week due to her physical and mental condition. Key people quickly found a bed for her and she has been in evaluation since Friday. I so pray something good comes from this. What good can come if she goes back to live in her tent? Tomorrow’s menu is barbecue baked beans with chicken and bacon, rice from El Pescador, cooked buttered carrots from Garman’s Pub, Spanish rice from El Pescador, croissants, chips and Pixie tangerines. Our mental health moments at our “Family Meetings” prior to dinner by Dr. Jason Miller bring relevance to our work and our guests. We do better when we see through new eyes. Next week’s profile is on our Finance Director and Project Manager, W. John Kulwiec, Emeritus A.I.A. Today was a good news day but, as always, filled with contrasts. Noe wanted in the worst way to have a magic wand waved over his love of alcohol but the best we could do is encourage him to get the kind of help that will last and that he can manage. Gloria Lozano from the RISE Team at Behavioral Health and Tom Boscarelli did not give up and were on call when Noe was ready. We knew he would and we knew they would. Noe (on the right) presented himself at 8 am this morning and waited until 10 for Gloria to transport him to SP Hospital for clearance and then on to Kephera House in Ventura. Please pay for Noe. The work of sobriety is hard and withdrawals are painful. Unfortunately, the best way to instantly feel better is another beer and that cycle has to be broken. Pray for him to have courage, comfort and confidence in his future. Further, pray for housing. If he comes out and is back on the streets, he is almost doomed. Others in the photo are Maria Sanchez who hosts the Drop In Center and helper, Larry Hicks, a member of the Behavioral Health Advisory Board. The other good news is that Rocco is back home. Some of you know that SPIRIT of Santa Paula touches a lot of people in various ways. A few months ago, an attorney from the Public Defender’s office asked to me help with a family with six young children in great need of shepherding. Without going into detail, it has been one of the most challenging tasks. My Chaplain friend, Pam Scott, and I started with visits to the home. Mom was working but their resources are limited. The family’s challenges have ranged from flat tires on the freeway at midnight to utility disconnections, illness, leaking radiator, legal disputes with the father, court appearances and then the dog was picked up by Animal Control last week for no tags and no rabies shots. Thanks to SPARC, they were holding Rocco until the family could raise enough money to bring him home. The children were depressed and feeling another loss. This morning about 6:45, the youngest daughter called me and asked me to help with Rocco so she could get “happy again.” The mother called around 10 am to tell me she leaned her daughter had called and tried to apologize. We called SPARC, provided a credit card and Rocco went home with tags and his vaccinations. As a young one, I remember our family having similar needs but there was no one to call. So, everyone is happy again. This is Rocco, waiting for someone to come. Our new website will be launched this week. Our favorite pastor, Jenny Crosswhite, is quite the graphic artist and her husband, Daniel Sandoval, is quite the computer geek. They have been just the combination to put our new presentation together. Our opening pages reveal the happy faces of our amazing cooks and the launch day of our Shower Pods provided by the Ventura County Healthcare Agency. Next week, we will introduce you to our board members. We will begin with Dr. Bill Simmons, our own Futurist. His role is to challenge us to think about our work in today’s environment with a look to the future and what we can accomplish for God’s Kingdom here and now. I can hardly think beyond today. We need someone like Bill. Tomorrow’s menu is turkey and Swiss cheese with tomato with a curry flavored dressing on a croissant roll, Spanish rice from El Pescador, hot buttered carrots, cole slaw with raisins, and Pixie Tangerines. Thank you Mike Shore and Food Forward.